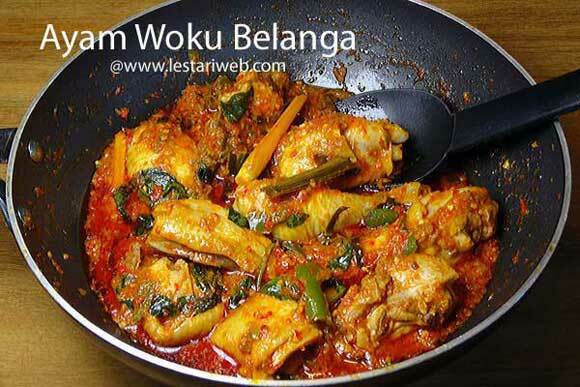 Ayam Woku Belanga, a very spicy chicken dish from Minahasan people who inhabit North Sulawesi Region. 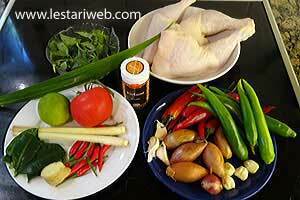 Many Indonesians also call them as Manadonese, refer to the capital city of North Sulawesi province. 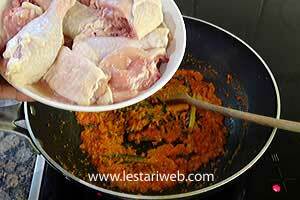 Manado cuisine is well known for their generous amount of spices that sometimes takes more than a half of the whole dish ingredients. 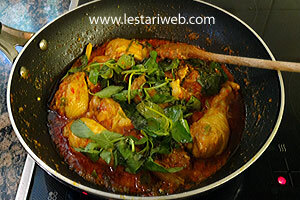 The spices that commonly used in Minahasan cuisine include: lemongrass, kaffir-lime leaf, sweet basil leaf/daun kemangi, pandanus leaf, lime juice, birds chilli, spring onion, shallots, garlic and candlenut. 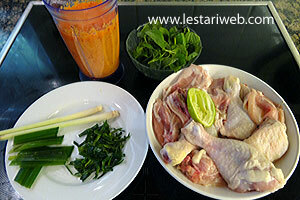 Cut the chicken in small portions and wash. Rub the chicken with salt and a half of lime juice. Keep aside for 30 minutes. 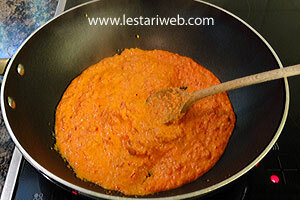 Put all ingredients for the paste in a blender or wet grinder and blend into smooth paste. Prepare & slice other ingredients/leaves. Heat 3 tbsp oil in a wok or shallow pan over medium-high heat and sautee the paste by stirring all the time until fragrant & well cooked (it takes about 5 minutes). 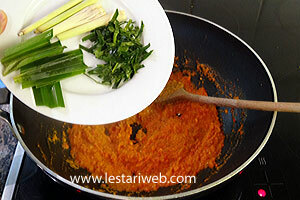 Add lemongrass, sliced kaffir-lime leaves, pandanus leaf and turmeric leaf (if any). 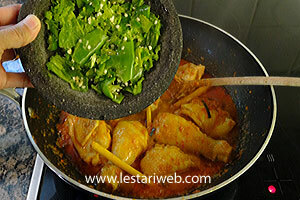 Continue stir-frying until the leaves just wilted. 5 Add the chicken pieces and stir to mix. 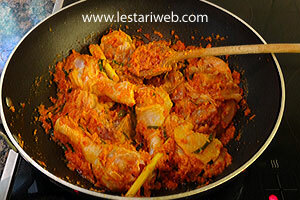 6 Keep cooking until the chicken becomes harder and it's colour turns to white. 7 Add the water, reduce the heat and cover the pan. 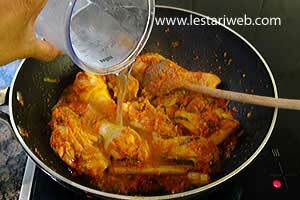 Cook over medium heat until the chicken becomes tender. 8 Add the green chili, cook until the sauce becomes thicken. Adjust the seasoning, add salt or sugar to taste. 9 Add the sweet basil and spring onions. Cook briefly until the leaves just wilted. 10 Remove from heat. 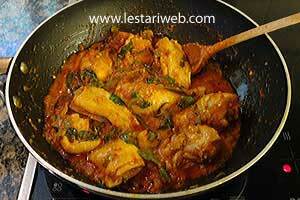 Serve hot with rice.